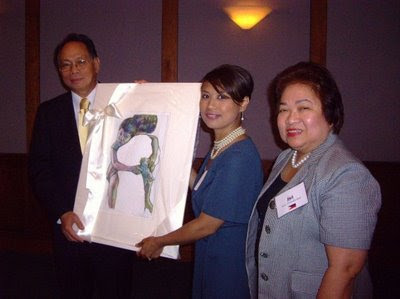 Above, I am presenting one of my prints as a gift to His Excellency Philippine Ambassador Willy Gaa and Mrs. Gaa. 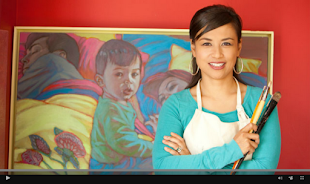 This piece was featured in the 2007 Exhibition, Engraven Upon the Hearts, A Celebration of Filipino Heritage, which was an solo exhibition at the Washington, DC Temple Visitors Center, comprised of mixed media and embossed intaglio prints based inspired by the testimonies of Filipino Latter-day Saints which I had collected from all over the world. Thus a crew and I pulled together a historical display of the history of the LDS Church in the Philippines, as well as displaying the collection of testimonies. In addition, we produced a film documentary to accompany the exhibition. The Ambassador and his wife were invited by the International Affairs & Public Affairs Office of the Church of Jesus Christ of Latter-day Saints to a private tour of the exhibition and dinner. 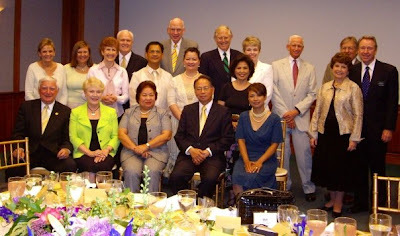 Attendees of the Private Dinner & Exhibition Tour: standing from the top left row are Anne Bowler (wife of Ken Bowler from Public Affairs); Mauri Earl from the International Affairs Office; Sister Hammond, matron of the DC Temple; Elder Hammond, DC Temple President; Zaldy Sabino, from the State Department; Senator Bennett; Mary Sabino, wife of Zaldy Sabino; Area Authority, Elder Hardy; Dr. Minda Datoc (my mother); Sister Hardy; Bishop Richard Marriot; Ken Bowler, Director of Public Affairs for the Church; Sister Patricia Child & Elder William Child, Director of the DC Temple Visitors Center. Seated are former Congressman Santini; wife Ann Santini Director of the International Office of the Church; Mrs. Erlinda Gaa, wife of the Ambassador; His Excellency Ambassador Willy Gaa; and myself, Rose Datoc Dall.